Green is THE color of spring, wouldn’t you say? It’s what I find myself reaching for over and over again as I add spring touches to my house and my spring wreath is no different. 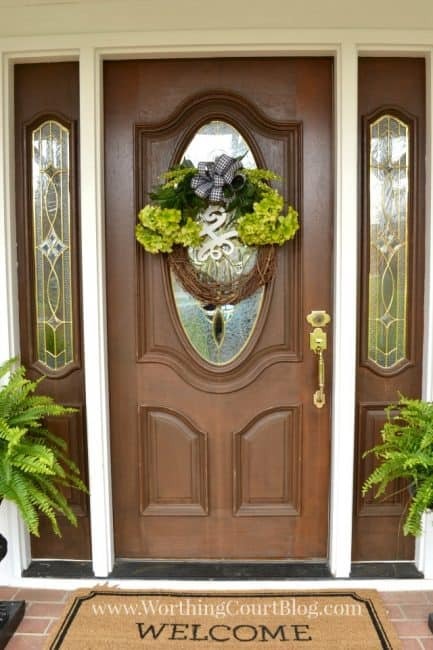 I’m thrilled with how it looks on my front door flanked by a pair of Boston ferns in black pedestal urns. I especially love the black and white checked ribbon paired with all of the shades of green. 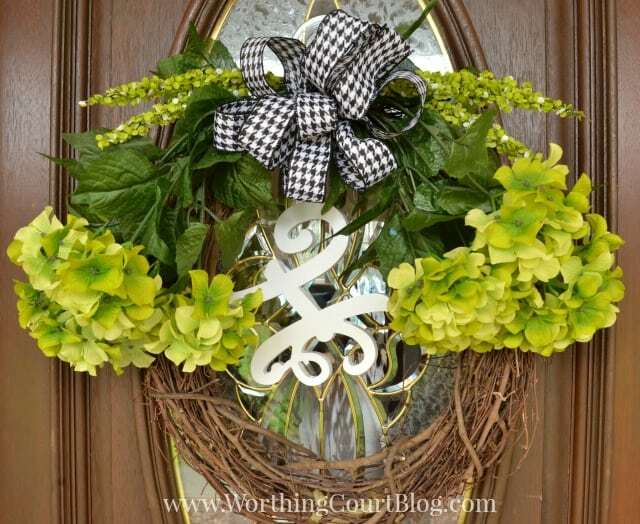 This wreath and the bow to go with it is super easy to make. Anyone can do it! Let me show you how. Depending on what you use, you may not need to do this step. I only wanted to use the bushy things out of my bunch of spiky grass, so the first thing to do was to cut those out. I’ll use the leftover grassy piece on something else. 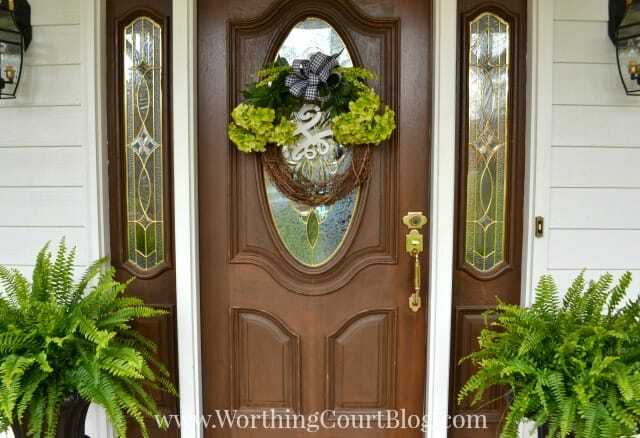 Place the flower bushes end-to-end and bend them so that they follow the curvature of the wreath. Do the same thing with the spiky things. Leaving room for a bow, wrap them all together with floral wire. Wrap it tightly so nothing will slip out of place. 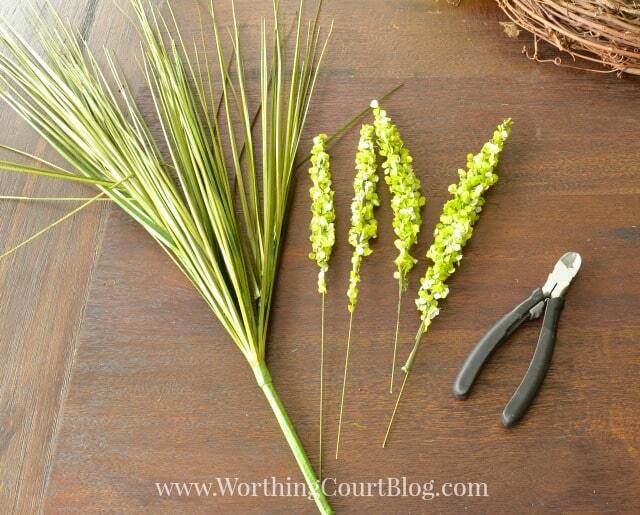 Make the floral wire long enough so that you can attach the bunch to the wreath after the ends have been wrapped together. 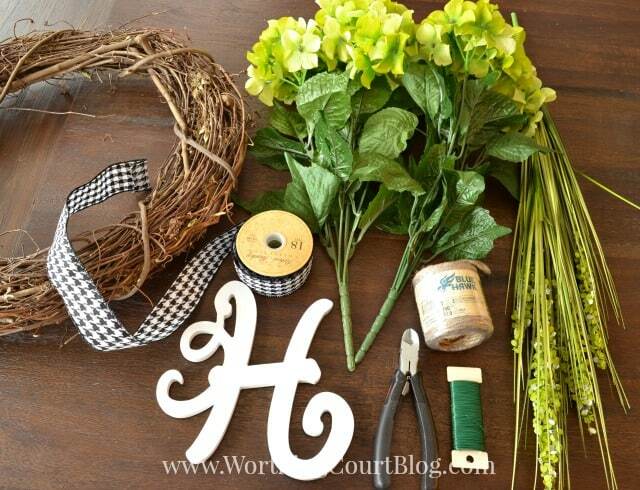 Using a piece of twine, tie the letter to the wreath where the flowers are wired to it. I tied mine with a bow in case I wanted to adjust the length of it later. Make the bow. If you’ve never made a bow, don’t be intimidated! I highly recommend using wired ribbon because it makes it so much easier. Another tip is to use ribbon that is printed on both sides or else has the design woven completely through it. All I do is to make several loops of ribbon stacked on top of one another. The length of your loops will be the approximate width of the finished bow. The more loops, the more full the bow will be. This particular bow has nine loops of ribbon. I make the last couple of loops (which will wind up at the front of the bow) a little shorter than the rest, with the very last loop being the shortest. Always make an odd number of loops. Once you are satisfied with the loops, cinch the layers of loops together and secure with floral wire. 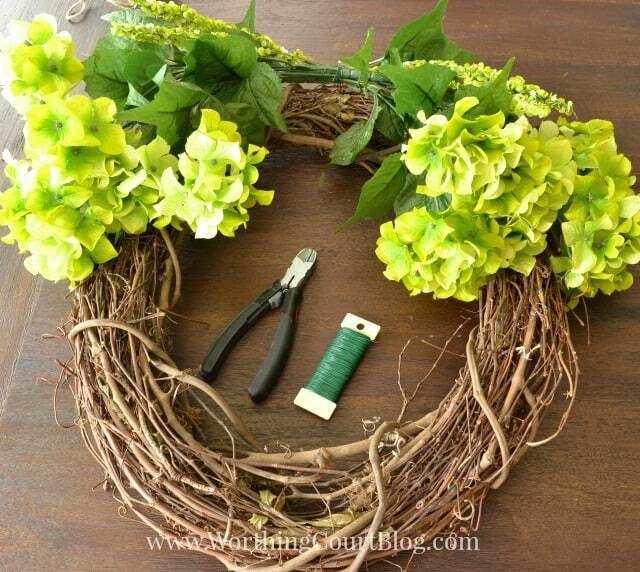 Make the wire long enough to attach the bow to the wreath, covering up the place where the flowers are wired together. When the bow has been attached, pull and twist on the loops of ribbon in all different directions to get it to look like you want it to. 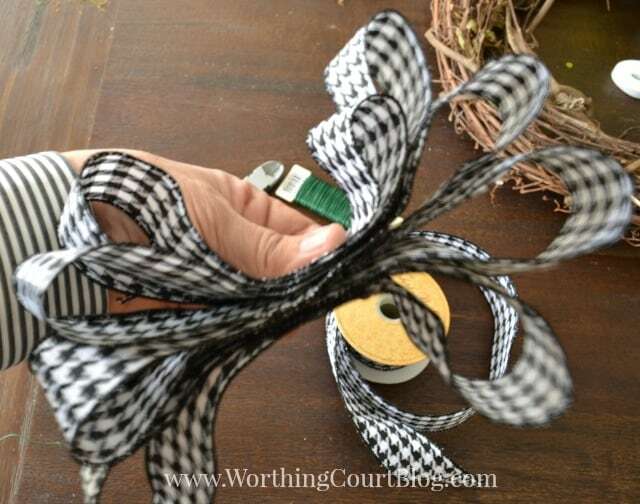 Here’s how the loops of ribbon look before being cinched and wired. And you’re done! Hang your wreath and enjoy! Beautiful! 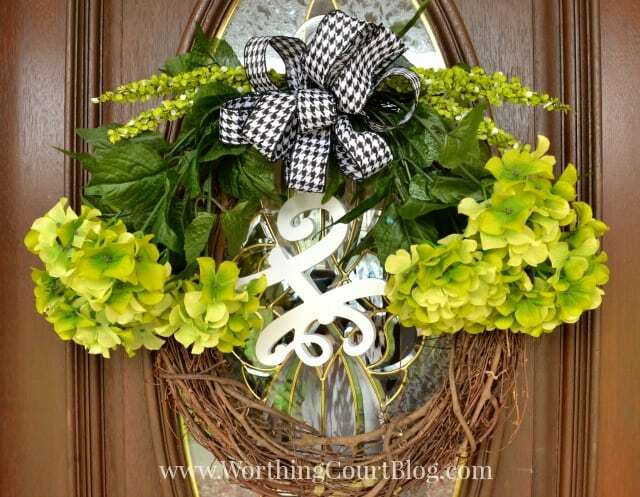 Love the black and white and green (a color combo I’m planning on infusing on my porch!) and the bow tutorial is one I’ll be tucking away for future reference! 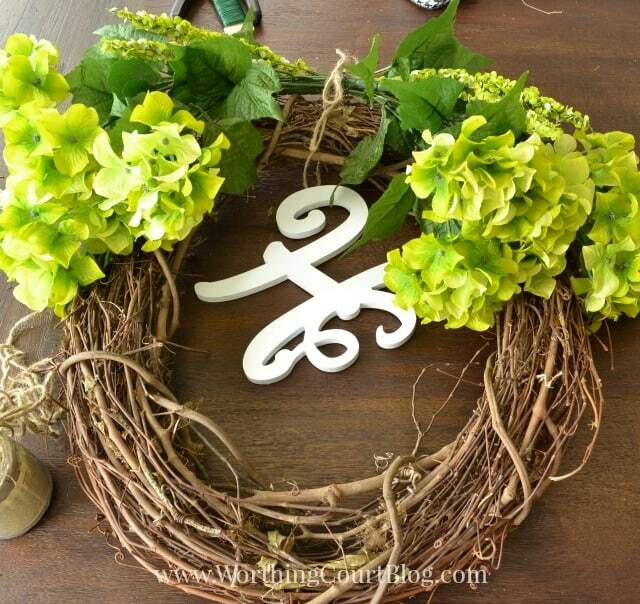 So happy to be celebrating our Spring wreath ideas with you, my friend! I just love it! I have always loved black and white with shades of green, my favorite color. This could definitely carry you through into summer as well!! Happy spring, friend! The black and white ribbon looks great with the spring green. So welcoming at your door. I love this! The flowers look so realistic! Great job! Oh wow – Thank you, Robin! So simple, yet VERY nice!!!!! Thanks!